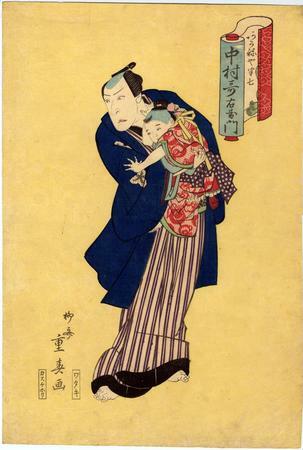 Nakamura Utaemon III as Akaneya Hanshichi holds his son in a drama whose main characters were the lovers Akaneya Hanshichi, the son of a sake merchant in the Yamato province, and Minoya Sankatsu, a courtesan of Ōsaka. Both characters really existed and committed double suicide the 7th of the 12th lunar month of 1695 in the burial ground of Sennichi in Ōsaka.
" "Sankatsu and Hanshichi" is the popular name of plays for both the puppet and Kabuki stages, treating the suicide of lovers of the same name. The real-life incident on which the plays are based took place in 1695, when Sankatsu, adopted daughter of Minoya Heizaemon of Nagamachi in Osaka, and Akaney Hanshichi of Gojō in Yamato Province, commited love-suicide together in the Namba district fo Osaka. The most famous theatrical version of the story is the play Hade sugata onna mai-ginu, first performed in 1772." Quoted from: The Passionate Art of Kitagawa Utamaro by Asano and Clark, text volume, p. 207.